In late August, the usually busy Girl Guide Camp of Bonita Glen wasn’t filled with its usual campers. Instead of girls attending summer camp, a group of former campers from as far back as the 1940’s, were there to celebrate and learn about the camp they spent summers at as girls. This time they were attending a dedication ceremony in honour of Blanche Hodgins, the camp’s namesake. As the nearly 80 people who attended discovered, Bonita Glen was founded by two very inspirational and dedicated women—Estelle Wishart and Blanche ‘Bonita’ Hodgins. Alison Sanders told the crowd about her grandmother’s passion for camping and how her guiding nickname was Bonita. 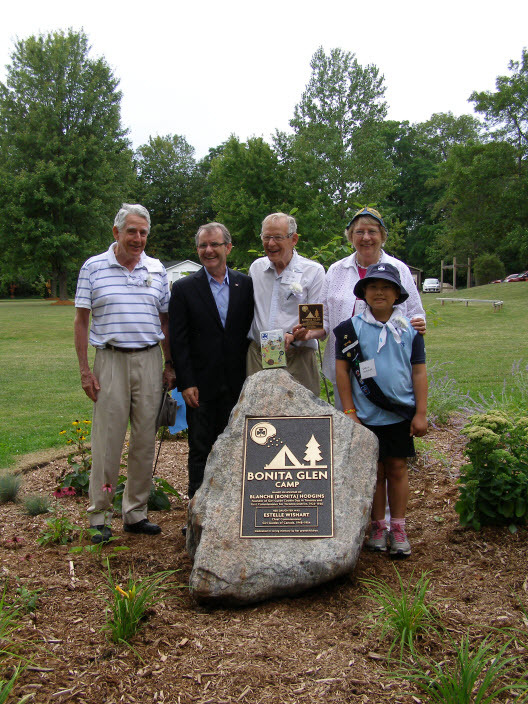 Recognizing a need for a place to call their own in 1929 Bonita started a Girl Guide camp on a glen near King, ON. 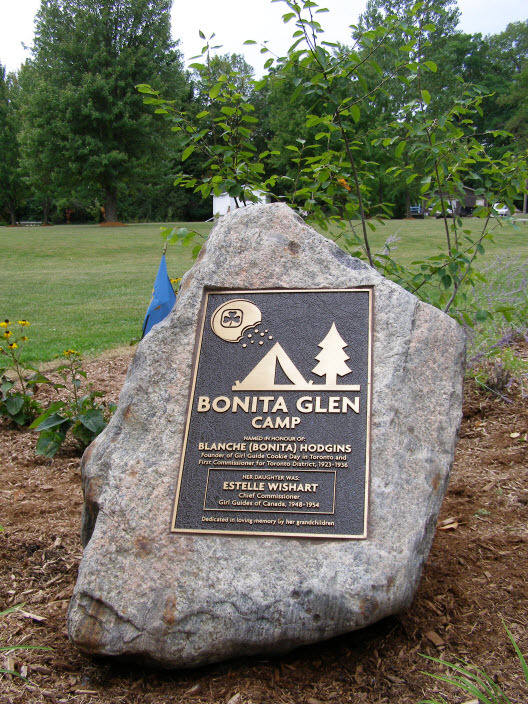 In her honour, the camp was named Bonita Glen. The camp was a huge success. In 1938, in search of waterfront, the original camp was sold and moved to Hawkestone. To this day, the camp is used year-round and is available for any Girl Guide Unit who wishes to book it. In honour of both these women and what they represent to Guiding, their family dedicated a plaque to their memory and contributions to the camp. The plaque, designed by Alison’s son John, commemorates Bonita’s love for camp and her idea of selling cookies to help pay for the property’s upkeep—a tradition that has exploded and is still integral to Girl Guides today. Bonita’s legacy includes a camp for Girl Guides to enjoy and a family that still boosts three generations participating in girl guiding. For many of her family this was their first time on the camp site and they had only good things to say. For former Girl Guides turned Leaders and Trefoil (the designation for members 30 years old and older) returning to the site was a trip down memory lane. The plaque was well received by everyone in attendance and sits in a garden that was donated and constructed by Ego’s Garden Centre. It will serve as a reminder and educator for all who attend the camp in the future. “Boy how this camp has changed,” said one former camper. “It’s probably been 50 years or more since I’ve been here, and it looks good,” said another. Reminiscing about camps and activities continued well into the afternoon, showing everyone who attended, that you’re never too old to go back to camp. By guest blogger Alana Britten. This piece was edited from an article Alana posted in a local newspaper about the plaque dedication event recently. This entry was posted in Girls' Guides and tagged herstory, photo sharing. Bookmark the permalink.